Millions of lights will be switched off tonight in homes, offices and landmarks all around the world. 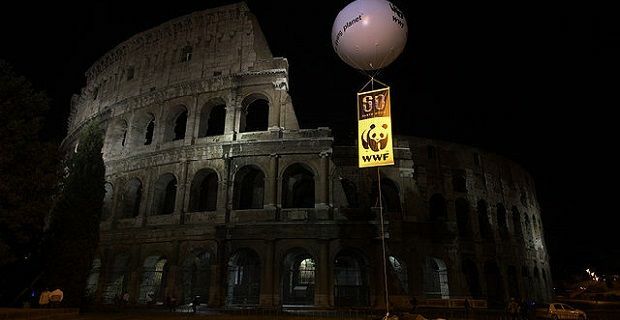 The annual event that’s organised by the World Wide Fund for Nature (WWF) has been around since 2008 when 400 cities in 35 countries participated by switching their lights off between 8pm and 9pm. This year, Earth Hour begins at 8.30pm local time. The WWF’s annual Earth Hour is supported by lots of well-known organisations across many different industries including sporting organisations FIFA, UEFA, Manchester United and the National Hockey League. Retailers Ikea and The Body Shop also support the initiative as do UNESCO and the UN Environment Programme. The mass participation that Earth Hour enjoys helps support the WWF’s climate change campaign and draws attention to the issue. The timing of this year’s event could not have been better as the Intergovernmental Panel on Climate Change will launch its latest report on Monday which outlines global warming’s effect on water, weather, food supplies and wildlife. Home owners and business owners will do their bit by switching lights off for an hour, but governments and councils across the world will also be involved as famous landmarks like the Empire State building in New York, the Burj Khalifa in Dubai and the Eiffel Tower in Paris will be darkened for an hour. The lights on the London Eye, Tower Bridge the Houses of Parliament and Buckingham Palace will also be dimmed tonight. An estimated 10 million homes in the UK will also join in.